Do the Democrats smell blood in the purple waters of Arizona? Given our Tea Party Legislature’s current assault on the citizens of Arizona. Let’s hope so. Democratic Party superstars–Bill, Hillary, and Chelsea Clinton and Nancy Pelosi– are coming to Arizona this spring for separate events. 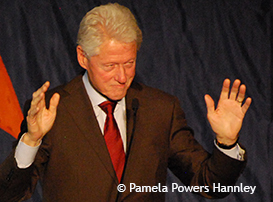 The Clinton Global Initiative University is sponsoring a university-based event at ASU on March 21-23. Details in our Calendar here and background here. Bill, Hillary, and Chelsea are all attending. As we look forward to the 2016 presidential race, you’ll remember that Hillary took Arizona in 2008. My theory has always been that she won Arizona (over Barack Obama and John Edwards) because she didn’t send the “second string” to Pima County (where the Democrats live!). She and Chelsea rocked the house in Bear Down Gym and to the overflow crowd that filled the mall and watched her on remote TV. It was one of the most exciting political speeches I ever heard. 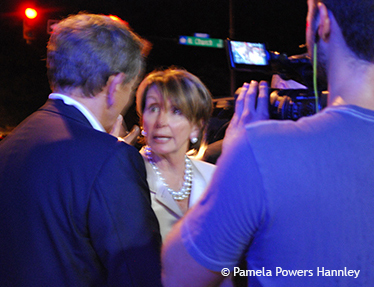 Nancy Pelosi talking with reporters at the Democratic National Convention, 2012. In April, Congresswoman Nancy Pelosi will a special guest at the Arizona Democratic Party’s State Committee Meeting. This is obviously a “rally the troupes” moment. This meeting was scheduled originally for April 12 in Tucson but has been changed to Phoenix. (As one BfAZ author remarked, “Didn’t they think Pelosi could find Tucosn?) Stay tuned for more information on both of these events and, most likely, related campaigning while the stars are in the state. Previous articleDear John… Huppenthal that is. Why get upset with Channel 12?